Pinot Noir wines are one of the most universal wines in the world. There are so many unique styles and flavor profiles based on different terroirs and vintner processes. 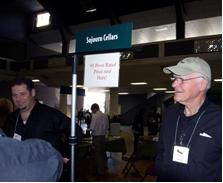 One event that I have attended over the past few years is Pinot Days. For 2012 this event was held at the Shrine Auditorium in downtown Los Angeles. In previous years it was held at the Barker Hanger in Santa Monica. Though I do not enjoy downtown treks, the sponsor provided easy to follow directions and parking was right next to the auditorium. Eve already did a great job of listing all the wineries present at this event so no need to list them again. Looking at the list of wineries you will soon realize that you cannot sample every wine that was being poured even using wine sampling techniques as tasting, spitting and dumping. 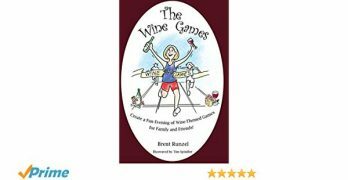 For this event I would like to write about a few wineries that I had no knowledge of and spent some time discussing their products and processes. One such winery that I was directed to by Eve was Pali. 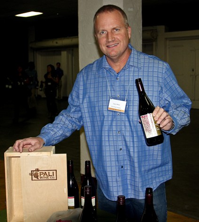 Reaching their tasting table I was greeted by Gary White who is a Partner and National Sales Director for Pali wines. The Pali winery and tasting room is in the town of Lompoc, CA and is named after the Pacific Palisades on the coast just west of Los Angeles. Lompoc is the same area of other fine Pinot producers such as Loring and Sea Smoke. Pali’s wines range from $20 to $55 dollars. The wines that impressed my wife and I were the Pinots that were in the low $20 range, they were fantastic. If I did not tell you the price on these wines and poured you a glass you would swear it was a $50 Pinot Noir. 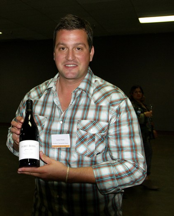 Wine Spectator said that the 2010 Pali Riviera Pinot Noir is a “Great American Value Red”. Tracy and I both agree with Wine Spectator and the cost is only $21 a bottle. Another great wine that my wife really loved was MacRostie Winery. Martha Muleady was present to pour some of their fine wines. Martha poured us two very unique wines. The first was a 2011 Pinot Noir Rosé. The grapes for this Pinot Noir Rosé came from the Alta Vista Vineyard which borders on the Sonoma side of Los Carneros. It is made from 100% Pinot Noir and was very good. Unlike most California Rosé wines, it was very dry on the palate making it somewhat French in style. The Pinot Noir grape adds a unique flavor of soft fruit such as strawberries on the nose and palate. A very nice wine for those hot summer days. The other wine poured was a 2008 Pinot Noir where the grapes come exclusively from their Sonoma Wildcat Mountain Vineyard. This Pinot Noir was dark in color with a black cherry nose, it is full bodied for those that enjoy the Arnold Schwarzenegger style of these wines. Soujourn was represented by Rich Haserot. I had a very interesting time discussing the different paths that the Pinot Noir wines have taken over the years with Rich. Sojourn is definitely on the right track producing wines that are receiving high point ratings for their wines. The winery is in Sonoma where they also produce Cabernet Sauvignon and Chardonnay. The Pinot Noir that I tasted had a velvet feel in the mouth with flavors of cherry and spice leading to a long finish. The quality and care that this winery has put into their product is phenomenal. Here are some of their wines along with prices and ratings as reported in the Pinot Report. 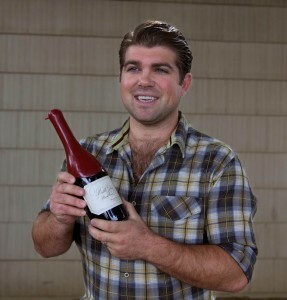 The Pinot Noirs poured by Aaron Elliot from the Fort Ross Winery struck a soft spot with me. The wines were well balanced with a beautiful cherry flavor reminiscent of some Burgundy wines that I have had. To produce this fantastic Pinot Noir, Fort Ross brought Jeff Pisoni on as their winemaker. The Pisoni family have a very solid reputation in Santa Lucia Highlands where they produce their own label of Pinot Noirs. Fort Ross is primarily a Pinot Noir vineyard that is developing wines in the Burgundian style. They are made from blending grapes from various vines such as Calera, Pommard, and Swan as well as Dijon clones 115 and 777. The first time that I found out about this process was on a tour of the Justin Winery where they blend many different Cabernet Sauvignon grapes to develop the base for their Isosceles Reserve. In the case of Fort Ross, there are so many distinct flavor profiles from regions as well as clones, the sky is the limit to what they can do. Add the artistry of Jeff Pisoni and you have a treasure that you will want to build verticals out of. Generally I pass up well known wineries that I know to allow more time for other wineries that I am not familiar with at these festivals. However, when Belle Glos is being poured you stop in awe knowing this winery has been producing great Pinot Noirs for many years. 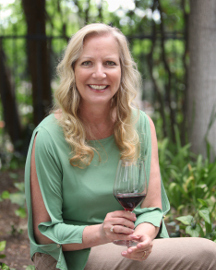 Their lineup ranges from the Meiomi to their higher end Pinots from Taylor Lane Vineyard in Sonoma Coast, Clark & Telephone Vineyard in Santa Maria Valley and Las Alturas Vineyard in Santa Lucia Highlands. These three regions offer a lot of variation in the flavor profile of pinot grapes. Adding to the treat of stopping to just taste their great wines, I was honored to meet Joe Wagner. Joe is the son of Chuck Wagner who tends to Caymus where they make a highly sought after Cabernet Sauvignon. Joe was given the honor by his family to be the winemaker for Belle Glos in 2002 at the age of 20. In 10 years he has not missed a beat continuously producing that velvety cherry flavored wine with subtle spices that is loved by all. The Wagner family has been producing great wines for many years and with this young winemaker I see it continuing for years to come. 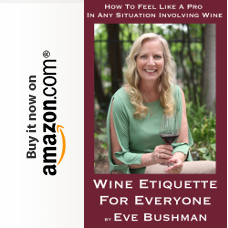 Though I only wrote about a few of the wineries it is not meant to say that there were not other great wineries, I just did not have the time to talk with all the vintners to learn about and try their products. There were so many great Pinot Noir producers and I found each and every one unique in their own way. What seemed to run high amongst the wineries was their passion, thus adding a little bit of themselves into their wines to make them unique and stand out in the crowd. 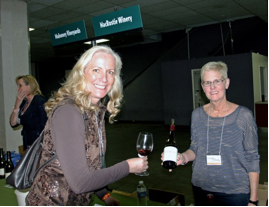 If you have never been to the Pinot Days Festival I would add it to your calendar for next year. 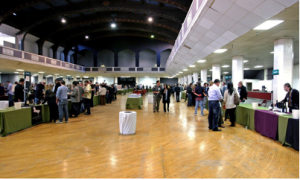 Everyone that I saw and spoke with had a great time losing themselves amongst the many tasting tables at the Shrine Auditorium.